Faith Technologies, an energy expert and national leader in electrical planning, engineering, design and installation, in partnership with Excellerate Manufacturing, is unveiling a state-of-the-art, clean-energy mobile microgrid at this year’s EAA AirVenture Oshkosh in Oshkosh, Wisconsin. Faith Technologies is an industry leader in microgrid energy solutions and recently unveiled one of the country’s most comprehensive microgrids at the Gordon Bubolz Nature Preserve in Appleton, Wisconsin, demonstrating their innovative energy capabilities. As a follow-up to the advanced, stationary microgrid, Faith has launched a new mobile microgrid that will help serve mission-critical government buildings, military operations, telecommunications, off-the-grid locations, businesses affected by natural disasters or power outages, and any locations that can’t afford to be without power. A microgrid provides efficiency, sustainability and resiliency, and is a cost-effective, eco-friendly way to produce and distribute energy. 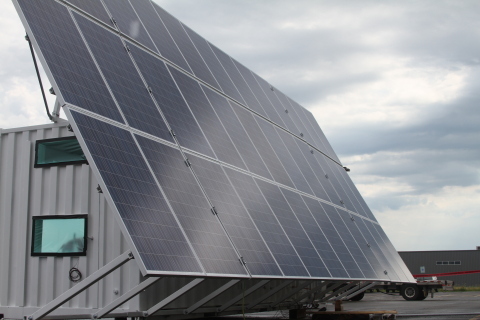 A mobile microgrid is an independent, deployable power solution that can be used to supplement power sources in the event of a disruption to power. An advantage of a mobile microgrid is that it can be transported wherever it is needed because of its smaller size. If needed, several mobile microgrids can be tied together to create a larger power source. An example of this is the current situation in Puerto Rico, where some have been without power for more than 300 days since hurricane Maria. One power outage can cost a business anywhere from $250,000 to $1 million. These disaster situations helped inform some of the design choices for the prototype created by Faith. “Excellerate’s goal is to make these units “configured to order,” meaning building one specifically created for any one business is relatively custom and quick. Additionally, through leveraging Faith’s capital and investment services, microgrids can be procured through Faith as an operational expense line item, in a way that not only reduces overall energy spend, but avoids lengthy capital expenditure processes,” Jansen said. The mobile microgrid’s integrated distributed energy resources (DERs) are managed by a control system designed and implemented by Faith Technologies, utilizing a Schneider Electric Automation Server controller. The mobile microgrid utilizes Schneider’s Conext XW+ solar hybrid inverter and MPPT charge controller system for grid-tie backup and off-grid solar solutions. The control system can autonomously configure the DERs into a range of different variations to produce the most resilient, efficient, clean, and cost-effective combination of energy resources available at any given time. The advanced mobile microgrid incorporates 9 kW solar photovoltaic energy; 144 kWh sophisticated lithium-ion battery energy storage system; 10kW methanol reformer based, hydrogen fuel cell system by Altergy; industrial Ethernet switch for controls and remote connectivity by Westermo—all combined in a 20 foot by eight foot intermodal freight container. Established in 1972, Faith Technologies, Inc. is an energy expert and national leader in electrical planning, engineering, design and installation. As a comprehensive authority in the field of electrical and energy services, Faith leads industry change through a dedicated investment in technology, strategic project consulting and process engineering that drives productivity, value, and above all, safety. Breaking industry benchmarks, Faith drives trends in growth and development through continual investment in their merit-based employees’ skill, leadership and career development. Faith Technologies is headquartered in Menasha, Wisconsin and has regional offices throughout the country. For more information on news, press and accolades, visit faithtechnologies.com/news, or learn more at faithtechnologies.com. Excellerate is an electrically focused manufacturer of made-to-stock assemblies through custom-engineered construction solutions that drive cost savings, schedule compression and safety excellence. Excellerate serves the energy, manufacturing, supply chain and construction landscape.